The Orange County Gay Agenda is a community calendar designed for the Orange County Lesbian, Gay, Bisexual, and Transgender Community to find and post events. You can search the color coded categories or search by tags (keywords). If you are looking for something to do, you can find it here. If you have an event you would like to share, you can post it here. Despite the catchy and tongue and cheek name, this calendar is for everyone! Join your community and have some fun! Want to see the month’s events all in one place? Click here to view a printable calendar! Have an event you would like to feature here? Just click on the green “+Post Your Event” Button. Meet-up Organizers, you are welcome here! Study With Pride is a tutoring group for LGBTQIA youth ages 13-18. Youth are invited to stop by for homework help and tutoring on topics, such as math, science, and writing, and grab a snack in a safe and supportive environment. Study with Pride meets every Wednesday from 5:00-6:00 pm in the Youth Room. Join us for API, a new Asian and Pacific Islander LGBTQ+ Group! Meets in the community room at the LGBT Center OC on 1605 N. Spurgon St., Santa Ana. Every Wednesday, 6:30 – 8:00PM. Contact tay.amimoto@lgbtcenteroc.org for more information! Please note, our Men’s Therapy Group now meets on Wednesdays. The goals of this group are: to create a safe, comfortable place to express feelings, exploration of self through group process and reflection, enhancing sense of self through awareness and acceptance, and to support and be supported. Cost is $10 per group. Closed Group. Please contact leader before attending. Come and join us every 2nd and 4th Thursday at the LGBT Center OC on N. Spurgeon. This is a social group open to all South Asians in the LGBTQIA+ community and their allies. 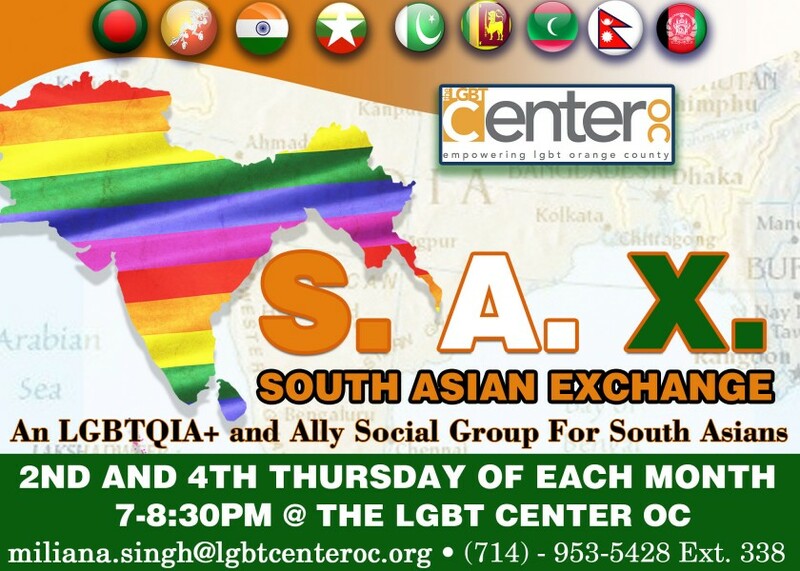 The mission of the South Asian Exchange is to bring together and empower the DESI and LGBTQ+ and allied communities by sharing beautiful cultures and building a sense of family and friendship through support groups and social events. This is a free group. Stop by and say hi every other Thursday! Check us out on Meetup and the OC Gay Agenda for future dates and updates! This group is open to gay, bisexual, pansexual, queer, and curious men, ages 21 years and older. This is a topic-centered group catering to the needs of men in this demographic. Meeting new people and making lasting friendships is just one of the goals of this group. We regularly incorporate educational workshops and social events throughout the year. Come be a part of something bigger than yourself and contribute back to the community and further your self-development in the process! INDIGO BALL Saturday, May 4th, 2019 Hotel Irvine May the 4th be with you! We are excited to announce Indigo Ball 2019 landing on Saturday, May 4th, 2019. Thank you to everyone who came out to support Indigo Ball 2018. It was a spectacular evening with special guests and out-of-this-world moments. We are lining up an even bigger Indigo Ball and hope you can join us on this galactic evening! Save the date and May the 4th be with you at Indigo Ball 2019! If you’re interested in sponsorship for Indigo Ball, please contact: Peg Corley at peg.corley@lgbtcenteroc.org Enjoy an evening of glitz and glamour as we present local musicians, incredible gourmet food, drinks, silent and live auctions and so much more! It will be our biggest gala yet!